This is an ImmutablePass solely for the purpose of exposing CodeGen options to the internals of other CodeGen passes. Definition at line 83 of file TargetPassConfig.h. Definition at line 392 of file TargetPassConfig.cpp. References EnableIPRA, llvm::TargetOptions::EnableIPRA, llvm::cl::Option::getNumOccurrences(), llvm::PassRegistry::getPassRegistry(), llvm::cl::opt_storage< DataType, ExternalStorage, std::is_class< DataType >::value >::getValue(), llvm::TargetOptions::GlobalISelAbort, if(), Impl, llvm::initializeAAResultsWrapperPassPass(), llvm::initializeBasicAAWrapperPassPass(), llvm::initializeCodeGen(), llvm::TargetMachine::Options, llvm::TargetOptions::PrintMachineCode, setRequiresCodeGenSCCOrder(), TM, and llvm::LLVMTargetMachine::useIPRA(). Definition at line 448 of file TargetPassConfig.cpp. Definition at line 327 of file TargetPassConfig.cpp. Add standard basic block placement passes. Definition at line 1209 of file TargetPassConfig.cpp. References addPass(), EnableBlockPlacementStats, llvm::MachineBlockPlacementID, and llvm::MachineBlockPlacementStatsID. This should be done before exception handling preparation passes. Definition at line 725 of file TargetPassConfig.cpp. References addPass(), llvm::createCodeGenPreparePass(), llvm::createRewriteSymbolsPass(), DisableCGP, getOptLevel(), and llvm::CodeGenOpt::None. Referenced by addISelPasses(), llvm::ARMBaseTargetMachine::createPassConfig(), and llvm::GCNTargetMachine::getTargetTransformInfo(). Add the actual instruction selection passes. This does not include preparation passes on IR. Definition at line 755 of file TargetPassConfig.cpp. References addGlobalInstructionSelect(), addInstSelector(), addIRTranslator(), addLegalizeMachineIR(), addPass(), addPreGlobalInstructionSelect(), addPreLegalizeMachineIR(), addPreRegBankSelect(), addRegBankSelect(), llvm::cl::BOU_FALSE, llvm::cl::BOU_TRUE, llvm::createResetMachineFunctionPass(), llvm::TargetOptions::EnableGlobalISel, llvm::TargetMachine::getO0WantsFastISel(), llvm::TargetMachine::getOptLevel(), isGlobalISelAbortEnabled(), llvm::CodeGenOpt::None, llvm::TargetMachine::Options, reportDiagnosticWhenGlobalISelFallback(), llvm::TargetMachine::setFastISel(), llvm::TargetMachine::setGlobalISel(), llvm::TargetMachine::setO0WantsFastISel(), and TM. addFastRegAlloc - Add the minimum set of target-independent passes that are required for fast register allocation. Add the minimum set of target-independent passes that are required for register allocation. Definition at line 1128 of file TargetPassConfig.cpp. References addPass(), addRegAssignmentFast(), llvm::PHIEliminationID, and llvm::TwoAddressInstructionPassID. Referenced by addMachinePasses(), and llvm::R600TargetMachine::createPassConfig(). addGCPasses - Add late codegen passes that analyze code for garbage collection. This should return true if GC info should be printed after these passes. Definition at line 1203 of file TargetPassConfig.cpp. This method should install a (global) instruction selector pass, which converts possibly generic instructions to fully target-specific instructions, thereby constraining all generic virtual registers to register classes. Definition at line 271 of file TargetPassConfig.h. These passes are run while the machine code is still in SSA form, so they can use MachineTraceMetrics to control their heuristics. 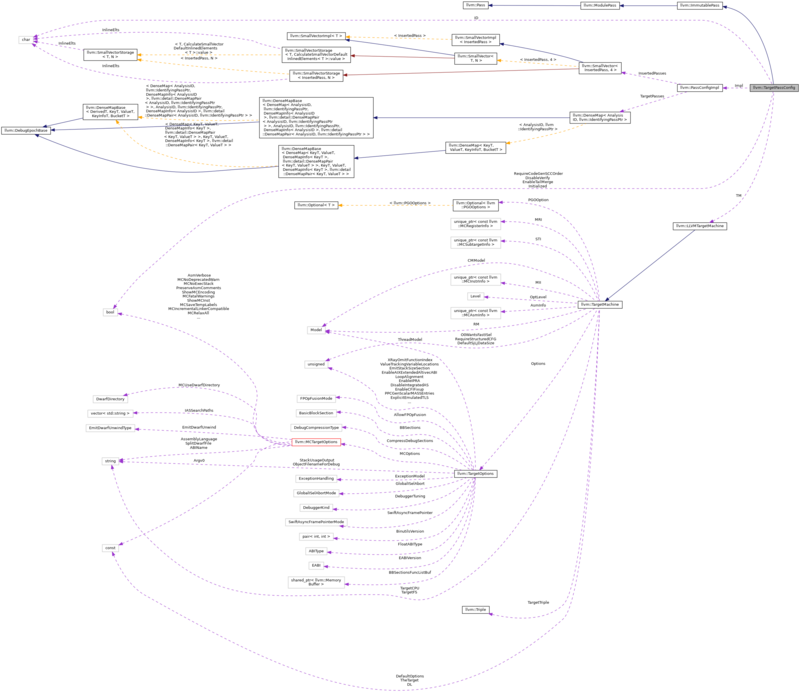 All passes added here should preserve the MachineDominatorTree, MachineLoopInfo, and MachineTraceMetrics analyses. Definition at line 353 of file TargetPassConfig.h. Referenced by addMachineSSAOptimization(), and llvm::R600TargetMachine::createPassConfig(). addInstSelector - This method should install an instruction selector pass, which converts from LLVM code to machine instructions. Definition at line 238 of file TargetPassConfig.h. Referenced by addCoreISelPasses(), and llvm::WebAssemblyTargetMachine::createPassConfig(). Add common target configurable passes that perform LLVM IR to IR transforms following machine independent optimization. Definition at line 607 of file TargetPassConfig.cpp. References addPass(), Andersen, Both, llvm::createBasicAAWrapperPass(), llvm::createCFLAndersAAWrapperPass(), llvm::createCFLSteensAAWrapperPass(), llvm::createConstantHoistingPass(), llvm::createExpandMemCmpPass(), llvm::createExpandReductionsPass(), llvm::createGCLoweringPass(), llvm::createLoopStrengthReducePass(), llvm::createMergeICmpsPass(), llvm::createPartiallyInlineLibCallsPass(), llvm::createPostInlineEntryExitInstrumenterPass(), llvm::createPrintFunctionPass(), llvm::createScalarizeMaskedMemIntrinPass(), llvm::createScopedNoAliasAAWrapperPass(), llvm::createShadowStackGCLoweringPass(), llvm::createTypeBasedAAWrapperPass(), llvm::createUnreachableBlockEliminationPass(), llvm::createVerifierPass(), llvm::dbgs(), DisableConstantHoisting, DisableLSR, DisableMergeICmps, DisablePartialLibcallInlining, DisableVerify, getOptLevel(), llvm::CodeGenOpt::None, PrintLSR, and Steensgaard. Referenced by addISelPasses(), llvm::RISCVTargetMachine::createPassConfig(), llvm::SparcTargetMachine::createPassConfig(), llvm::HexagonTargetMachine::createPassConfig(), llvm::WebAssemblyTargetMachine::createPassConfig(), llvm::XCoreTargetMachine::createPassConfig(), llvm::AArch64TargetMachine::createPassConfig(), llvm::PPCTargetMachine::createPassConfig(), llvm::X86TargetMachine::createPassConfig(), llvm::ARMBaseTargetMachine::createPassConfig(), llvm::MipsTargetMachine::createPassConfig(), llvm::NVPTXTargetMachine::getTargetTransformInfo(), llvm::GCNTargetMachine::getTargetTransformInfo(), and llvm::SystemZTargetMachine::SystemZTargetMachine(). This method should install an IR translator pass, which converts from LLVM code to machine instructions with possibly generic opcodes. Definition at line 244 of file TargetPassConfig.h. High level function that adds all passes necessary to go from llvm IR representation to the MI representation. Adds IR based lowering and target specific optimization passes and finally the core instruction selection passes. Definition at line 821 of file TargetPassConfig.cpp. References addCodeGenPrepare(), addCoreISelPasses(), addIRPasses(), addISelPrepare(), addPass(), addPassesToHandleExceptions(), llvm::createLowerEmuTLSPass(), llvm::createPreISelIntrinsicLoweringPass(), llvm::createTargetTransformInfoWrapperPass(), llvm::TargetMachine::getTargetIRAnalysis(), TM, and llvm::TargetMachine::useEmulatedTLS(). Add common passes that perform LLVM IR to IR transforms in preparation for instruction selection. Definition at line 733 of file TargetPassConfig.cpp. References addPass(), addPreISel(), llvm::createPrintFunctionPass(), llvm::createSafeStackPass(), llvm::createStackProtectorPass(), llvm::createVerifierPass(), llvm::dbgs(), DisableVerify, PrintISelInput, and requiresCodeGenSCCOrder(). This method should install a legalize pass, which converts the instruction sequence into one that can be selected by the target. Definition at line 252 of file TargetPassConfig.h. Add passes that optimize machine instructions after register allocation. Definition at line 1187 of file TargetPassConfig.cpp. References addPass(), llvm::BranchFolderPassID, llvm::MachineCopyPropagationID, llvm::TargetMachine::requiresStructuredCFG(), llvm::TailDuplicateID, and TM. Add the complete, standard set of LLVM CodeGen passes. Add the complete set of target-independent postISel code generator passes. Fully developed targets will not generally override this. This can be read as the standard order of major LLVM CodeGen stages. Stages with nontrivial configuration or multiple passes are broken out below in addStage routines. Any TargetPassConfig::addXX routine may be overriden by the Target. The addPre/Post methods with empty header implementations allow injecting target-specific fixups just before or after major stages. Additionally, targets have the flexibility to change pass order within a stage by overriding default implementation of addStage routines below. Each technique has maintainability tradeoffs because alternate pass orders are not well supported. addPre/Post works better if the target pass is easily tied to a common pass. But if it has subtle dependencies on multiple passes, the target should override the stage instead. TODO: We could use a single addPre/Post(ID) hook to allow pass injection before/after any target-independent pass. But it's currently overkill. Definition at line 860 of file TargetPassConfig.cpp. References addBlockPlacement(), addFastRegAlloc(), addGCPasses(), addMachineLateOptimization(), addMachineSSAOptimization(), addOptimizedRegAlloc(), addPass(), addPostRegAlloc(), addPreEmitPass(), addPreEmitPass2(), addPreRegAlloc(), addPreSched2(), AlwaysOutline, assert(), llvm::createGCInfoPrinter(), llvm::createMachineOutlinerPass(), llvm::createPrologEpilogInserterPass(), llvm::createRegUsageInfoCollector(), llvm::createRegUsageInfoPropPass(), llvm::dbgs(), EnableImplicitNullChecks, llvm::TargetOptions::EnableIPRA, llvm::TargetOptions::EnableMachineOutliner, llvm::StringRef::equals(), llvm::ExpandISelPseudosID, llvm::ExpandPostRAPseudosID, llvm::FEntryInserterID, llvm::FuncletLayoutID, getOptimizeRegAlloc(), getOptLevel(), llvm::PassRegistry::getPassInfo(), getPassInfo(), llvm::PassRegistry::getPassRegistry(), llvm::PassInfo::getTypeInfo(), llvm::cl::opt_storage< DataType, ExternalStorage, std::is_class< DataType >::value >::getValue(), llvm::ImplicitNullChecksID, insertPass(), isPassSubstitutedOrOverridden(), llvm::LiveDebugValuesID, llvm::LocalStackSlotAllocationID, NeverOutline, llvm::CodeGenOpt::None, llvm::TargetMachine::Options, llvm::PatchableFunctionID, llvm::PostMachineSchedulerID, llvm::PostRAMachineSinkingID, llvm::PostRASchedulerID, printAndVerify(), PrintGCInfo, llvm::PrologEpilogCodeInserterID, llvm::ShrinkWrapID, llvm::StackMapLivenessID, llvm::TargetOptions::SupportsDefaultOutlining, llvm::TargetMachine::targetSchedulesPostRAScheduling(), TM, and llvm::XRayInstrumentationID. addMachineSSAOptimization - Add standard passes that optimize machine instructions in SSA form. Add passes that optimize machine instructions in SSA form. Definition at line 987 of file TargetPassConfig.cpp. References addILPOpts(), addPass(), llvm::DeadMachineInstructionElimID, llvm::EarlyMachineLICMID, llvm::EarlyTailDuplicateID, llvm::LocalStackSlotAllocationID, llvm::MachineCSEID, llvm::MachineSinkingID, llvm::OptimizePHIsID, llvm::PeepholeOptimizerID, and llvm::StackColoringID. Referenced by addMachinePasses(), llvm::BPFTargetMachine::createPassConfig(), llvm::PPCTargetMachine::createPassConfig(), llvm::X86TargetMachine::createPassConfig(), and llvm::R600TargetMachine::createPassConfig(). Add standard target-independent passes that are tightly coupled with optimized register allocation, including coalescing, machine instruction scheduling, and register allocation itself. LLVMTargetMachine provides standard regalloc passes for most targets. Definition at line 1138 of file TargetPassConfig.cpp. References addPass(), addRegAssignmentOptimized(), llvm::DetectDeadLanesID, llvm::LiveIntervalsID, llvm::LiveVariablesID, llvm::MachineCopyPropagationID, llvm::MachineLICMID, llvm::MachineLoopInfoID, llvm::MachineSchedulerID, llvm::PHIEliminationID, llvm::ProcessImplicitDefsID, llvm::RegisterCoalescerID, llvm::RenameIndependentSubregsID, and llvm::TwoAddressInstructionPassID. Utilities for targets to add passes to the pass manager. Add a CodeGen pass at this point in the pipeline after checking for target and command line overrides. Add a CodeGen pass at this point in the pipeline after checking overrides. Return the pass that was added, or zero if no pass was added. printAfter if true and adding a machine function pass add an extra machine printer pass afterwards verifyAfter if true and adding a machine function pass add an extra machine verification pass afterwards. addPass cannot return a pointer to the pass instance because is internal the PassManager and the instance we create here may already be freed. Definition at line 564 of file TargetPassConfig.cpp. References llvm::Pass::createPass(), llvm::IdentifyingPassPtr::getID(), llvm::IdentifyingPassPtr::getInstance(), llvm::Pass::getPassID(), getPassSubstitution(), llvm::IdentifyingPassPtr::isInstance(), llvm::IdentifyingPassPtr::isValid(), llvm_unreachable, overridePass(), and P.
Referenced by addBlockPlacement(), addCodeGenPrepare(), addCoreISelPasses(), addFastRegAlloc(), addGCPasses(), addIRPasses(), addISelPasses(), addISelPrepare(), addMachineLateOptimization(), addMachinePasses(), addMachineSSAOptimization(), addOptimizedRegAlloc(), addPass(), addPassesToHandleExceptions(), addRegAssignmentFast(), and addRegAssignmentOptimized(). Add a pass to the PassManager if that pass is supposed to be run, as determined by the StartAfter and StopAfter options. Add a pass to the PassManager if that pass is supposed to be run. Takes ownership of the pass. printAfter if true and adding a machine function pass add an extra machine printer pass afterwards verifyAfter if true and adding a machine function pass add an extra machine verification pass afterwards. If the Started/Stopped flags indicate either that the compilation should start at a later pass or that it should stop after an earlier pass, then do not add the pass. Finally, compare the current pass against the StartAfter and StopAfter options and change the Started/Stopped flags accordingly. Definition at line 515 of file TargetPassConfig.cpp. References llvm::legacy::PassManagerBase::add(), addPass(), addPrintPass(), addVerifyPass(), assert(), llvm::Pass::getPassID(), llvm::Pass::getPassName(), Impl, Initialized, llvm::PassConfigImpl::InsertedPasses, P, and llvm::report_fatal_error(). Add passes to lower exception handling for the code generator. Turn exception handling constructs into something the code generators can handle. Definition at line 682 of file TargetPassConfig.cpp. References addPass(), llvm::ARM, assert(), llvm::createDwarfEHPass(), llvm::createLowerInvokePass(), llvm::createSjLjEHPreparePass(), llvm::createUnreachableBlockEliminationPass(), llvm::createWasmEHPass(), llvm::createWinEHPass(), llvm::DwarfCFI, llvm::MCAsmInfo::getExceptionHandlingType(), llvm::TargetMachine::getMCAsmInfo(), LLVM_FALLTHROUGH, llvm::None, llvm::SjLj, TM, llvm::Wasm, and llvm::WinEH. This method may be implemented by targets that want to run passes after register allocation pass pipeline but before prolog-epilog insertion. Definition at line 391 of file TargetPassConfig.h. Referenced by addMachinePasses(), llvm::WebAssemblyTargetMachine::createPassConfig(), and llvm::R600TargetMachine::createPassConfig(). This pass may be implemented by targets that want to run passes immediately before machine code is emitted. Definition at line 410 of file TargetPassConfig.h. Referenced by addMachinePasses(), and llvm::WebAssemblyTargetMachine::createPassConfig(). This is called even later than addPreEmitPass. Definition at line 417 of file TargetPassConfig.h. This method may be implemented by targets that want to run passes immediately before the (global) instruction selection. Definition at line 265 of file TargetPassConfig.h. Methods with trivial inline returns are convenient points in the common codegen pass pipeline where targets may insert passes. Methods with out-of-line standard implementations are major CodeGen stages called by addMachinePasses. 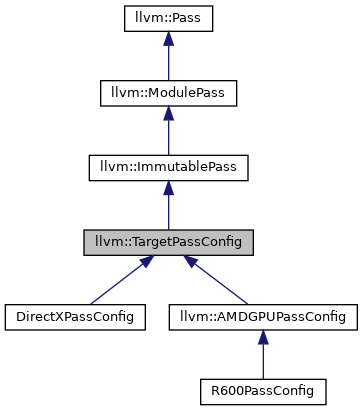 Some targets may override major stages when inserting passes is insufficient, but maintaining overriden stages is more work.addPreISelPasses - This method should add any "last minute" LLVM->LLVM passes (which are run just before instruction selector). Definition at line 339 of file TargetPassConfig.h. This method may be implemented by targets that want to run passes immediately before legalization. Definition at line 248 of file TargetPassConfig.h. This method may be implemented by targets that want to run passes immediately before register allocation. Definition at line 359 of file TargetPassConfig.h. This method may be implemented by targets that want to run passes immediately before the register bank selection. Definition at line 256 of file TargetPassConfig.h. addPreRewrite - Add passes to the optimized register allocation pipeline after register allocation is complete, but before virtual registers are rewritten to physical registers. These passes must preserve VirtRegMap and LiveIntervals, and when running after RABasic or RAGreedy, they should take advantage of LiveRegMatrix. When these passes run, VirtRegMap contains legal physreg assignments for all virtual registers. Note if the target overloads addRegAssignAndRewriteOptimized, this may not be honored. This is also not generally used for the the fast variant, where the allocation and rewriting are done in one pass. Definition at line 385 of file TargetPassConfig.h. This method may be implemented by targets that want to run passes after prolog-epilog insertion and before the second instruction scheduling pass. Definition at line 398 of file TargetPassConfig.h. Add a pass to print the machine function if printing is enabled. Definition at line 590 of file TargetPassConfig.cpp. References llvm::legacy::PassManagerBase::add(), llvm::createMachineFunctionPrinterPass(), llvm::dbgs(), llvm::TargetMachine::shouldPrintMachineCode(), and TM. Referenced by addPass(), and printAndVerify(). Add core register alloator passes which do the actual register assignment and rewriting. true if any passes were added. Definition at line 1093 of file TargetPassConfig.cpp. References addPass(), llvm::createFastRegisterAllocator(), createRegAllocPass(), llvm::report_fatal_error(), and useDefaultRegisterAllocator(). Definition at line 1102 of file TargetPassConfig.cpp. References addPass(), addPreRewrite(), createRegAllocPass(), llvm::StackSlotColoringID, and llvm::VirtRegRewriterID. This method should install a register bank selector pass, which assigns register banks to virtual registers without a register class or register banks. Definition at line 261 of file TargetPassConfig.h. Add a pass to perform basic verification of the machine function if verification is enabled. Definition at line 595 of file TargetPassConfig.cpp. References llvm::legacy::PassManagerBase::add(), llvm::cl::BOU_TRUE, llvm::cl::BOU_UNSET, llvm::createMachineVerifierPass(), llvm::LLVMTargetMachine::isMachineVerifierClean(), TM, Verify, and VerifyMachineCode. Similar to createMachineScheduler but used when postRA machine scheduling is enabled. Definition at line 294 of file TargetPassConfig.h. addMachinePasses helper to create the target-selected or overriden regalloc pass. Find and instantiate the register allocation pass requested by this target at the current optimization level. Different register allocators are defined as separate passes because they may require different analysis. This helper ensures that the regalloc= option is always available, even for targets that override the default allocator. FIXME: When MachinePassRegistry register pass IDs instead of function ptrs, this can be folded into addPass. Definition at line 1080 of file TargetPassConfig.cpp. References llvm::call_once(), createTargetRegisterAllocator(), llvm::RegisterRegAllocBase< RegisterRegAlloc >::getDefault(), initializeDefaultRegisterAllocatorOnce(), and useDefaultRegisterAllocator(). Referenced by addRegAssignmentFast(), and addRegAssignmentOptimized(). createTargetRegisterAllocator - Create the register allocator pass for this target at the current optimization level. Instantiate the default register allocator pass for this target for either the optimized or unoptimized allocation path. This will be added to the pass manager by addFastRegAlloc in the unoptimized case or addOptimizedRegAlloc in the optimized case. A target that uses the standard regalloc pass order for fast or optimized allocation may still override this for per-target regalloc selection. But -regalloc=... always takes precedence. Definition at line 1064 of file TargetPassConfig.cpp. Create an instance of ScheduleDAGInstrs to be run within the standard MachineScheduler pass for this function and target at the current optimization level. Definition at line 285 of file TargetPassConfig.h. Allow the target to disable a specific standard pass by default. Definition at line 195 of file TargetPassConfig.h. Allow the target to enable a specific standard pass by default. Definition at line 192 of file TargetPassConfig.h. Definition at line 1232 of file TargetPassConfig.cpp. Definition at line 174 of file TargetPassConfig.h. Referenced by getLayoutSuccessorProbThreshold(), and INITIALIZE_PASS(). If hasLimitedCodeGenPipeline is true, this method returns a string with the name of the options, separated by Separator that caused this pipeline to be limited. Definition at line 465 of file TargetPassConfig.cpp. References llvm::empty(), hasLimitedCodeGenPipeline(), StartAfterOpt, StartAfterOptName, StartBeforeOpt, StartBeforeOptName, StopAfterOpt, StopAfterOptName, and StopBeforeOpt. Return true if the optimized regalloc pipeline is enabled. Definition at line 1029 of file TargetPassConfig.cpp. References llvm::cl::BOU_FALSE, llvm::cl::BOU_TRUE, llvm::cl::BOU_UNSET, getOptLevel(), llvm_unreachable, llvm::CodeGenOpt::None, and OptimizeRegAlloc. Definition at line 423 of file TargetPassConfig.cpp. Referenced by addCodeGenPrepare(), addIRPasses(), addMachinePasses(), getLayoutSuccessorProbThreshold(), getOptimizeRegAlloc(), and INITIALIZE_PASS(). Return the pass substituted for StandardID by the target. If no substitution exists, return StandardID. Definition at line 495 of file TargetPassConfig.cpp. References I, Impl, and llvm::PassConfigImpl::TargetPasses. Referenced by addPass(), and isPassSubstitutedOrOverridden(). Definition at line 149 of file TargetPassConfig.h. Returns true if one of the -start-after, -start-before, -stop-after or -stop-before options is set. Definition at line 459 of file TargetPassConfig.cpp. References StartAfterOpt, StartBeforeOpt, and willCompleteCodeGenPipeline(). Insert InsertedPassID pass after TargetPassID pass. Insert InsertedPassID pass after TargetPassID. Definition at line 428 of file TargetPassConfig.cpp. References assert(), llvm::SmallVectorImpl< T >::emplace_back(), llvm::IdentifyingPassPtr::getID(), llvm::IdentifyingPassPtr::getInstance(), llvm::Pass::getPassID(), Impl, llvm::PassConfigImpl::InsertedPasses, and llvm::IdentifyingPassPtr::isInstance(). By default, it's enabled for non O0 levels. Definition at line 1228 of file TargetPassConfig.cpp. When this is disabled, GlobalISel will fall back on SDISel instead of erroring out. Definition at line 1220 of file TargetPassConfig.cpp. References llvm::Enable, llvm::TargetOptions::GlobalISelAbort, llvm::TargetMachine::Options, and TM. Referenced by addCoreISelPasses(), llvm::RegBankSelect::getAnalysisUsage(), and llvm::reportGISelFailure(). Return true if the pass has been substituted by the target or overridden on the command line. Definition at line 503 of file TargetPassConfig.cpp. References llvm::IdentifyingPassPtr::getID(), getPassSubstitution(), ID, llvm::IdentifyingPassPtr::isInstance(), llvm::IdentifyingPassPtr::isValid(), and overridePass(). printAndVerify - Add a pass to dump then verify the machine function, if those steps are enabled. Definition at line 585 of file TargetPassConfig.cpp. Check whether or not a diagnostic should be emitted when GlobalISel uses the fallback path. In other words, it will emit a diagnostic when GlobalISel failed and isGlobalISelAbortEnabled is false. Definition at line 1224 of file TargetPassConfig.cpp. References llvm::DisableWithDiag, llvm::TargetOptions::GlobalISelAbort, llvm::TargetMachine::Options, and TM. Definition at line 177 of file TargetPassConfig.h. Definition at line 172 of file TargetPassConfig.h. Definition at line 175 of file TargetPassConfig.h. Definition at line 154 of file TargetPassConfig.h. Definition at line 485 of file TargetPassConfig.cpp. Definition at line 178 of file TargetPassConfig.h. Allow the target to override a specific pass without overriding the pass pipeline. When passes are added to the standard pipeline at the point where StandardID is expected, add TargetID in its place. Definition at line 490 of file TargetPassConfig.cpp. Return true if the default global register allocator is in use and has not be overriden on the command line with '-regalloc=...'. Definition at line 1122 of file TargetPassConfig.cpp. Returns true if none of the -stop-before and -stop-after options is set. Definition at line 455 of file TargetPassConfig.cpp. Referenced by llvm::LLVMTargetMachine::addPassesToEmitFile(), llvm::LLVMTargetMachine::addPassesToEmitMC(), and hasLimitedCodeGenPipeline(). Definition at line 126 of file TargetPassConfig.h. Referenced by addIRPasses(), and addISelPrepare(). Default setting for -enable-tail-merge on this target. Definition at line 129 of file TargetPassConfig.h. Definition at line 146 of file TargetPassConfig.h. Referenced by isPassSubstitutedOrOverridden(), and overridePass(). Definition at line 121 of file TargetPassConfig.h. Referenced by addPass(), getPassSubstitution(), insertPass(), substitutePass(), and TargetPassConfig(). Definition at line 122 of file TargetPassConfig.h. Referenced by addPass(), and setOpt(). Require processing of functions such that callees are generated before callers. Definition at line 133 of file TargetPassConfig.h. Definition at line 120 of file TargetPassConfig.h. Referenced by addCoreISelPasses(), addISelPasses(), addMachineLateOptimization(), addMachinePasses(), addPassesToHandleExceptions(), addPrintPass(), addVerifyPass(), getOptLevel(), isGlobalISelAbortEnabled(), reportDiagnosticWhenGlobalISelFallback(), and TargetPassConfig().